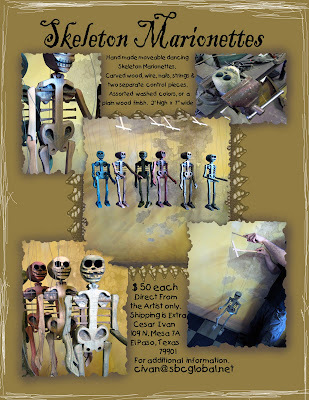 I received a nice email from El Paso artist Cesar Ivan that he'll be selling his handmade skeletons at the downtown Dia de los Muertos festivities. Think I'll have to get one! They look great! Also, here's a link to a Dia de los Muertos poem by Cesar, as well as some of his Dia de los Muertos-inspired paintings. Cesar is showing some of his paintings at Lumenbrite Café, so check 'em out!